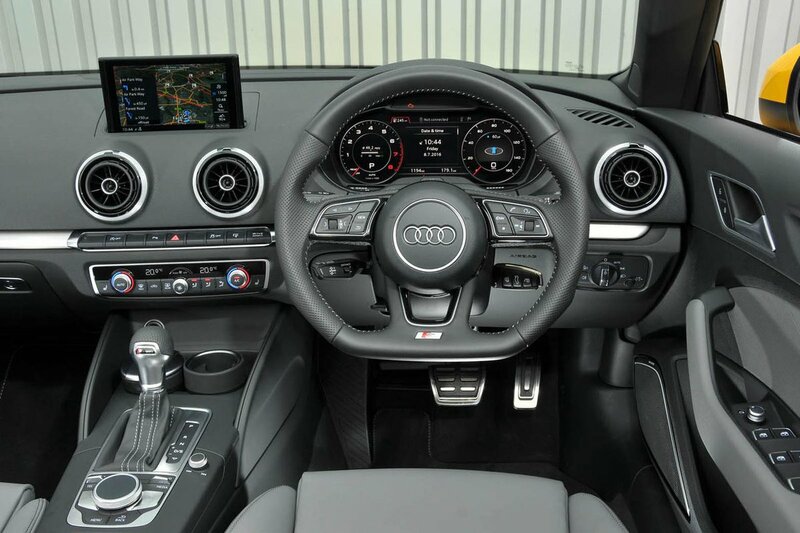 Audi A3 Cabriolet Interior, Sat Nav, Dashboard | What Car? 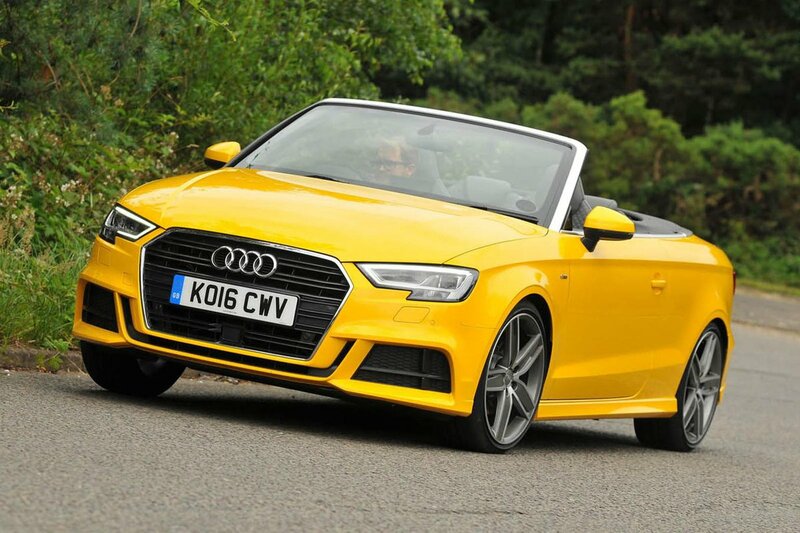 No driver should have a problem getting comfortable in the A3 Cabriolet. The steering wheel can be moved in and out, as well as up and down, and the seat position has a wide range of adjustment. The seatback angle is adjusted with a wheel that makes incremental changes easy to set. All models get supportive sports seats with chunky side bolsters, but it’s disappointing that even top-spec versions don’t come with adjustable lumbar support as standard. The pedals are well placed and the controls all conveniently located. Even on entry-level Sport versions, the steering wheel is a multi-function type that incorporates controls for the infotainment system and, on S tronic versions, gearshift paddles. Looking straight ahead, slim windscreen pillars and relatively large side windows mean that visibility is perfectly acceptable. Things aren’t so straightforward at the back of the car, though, especially when the roof is up and all you have is a small screen to peer through. Thankfully, all versions come with rear parking sensors. Obviously, rear visibility is much less of an issue with the roof down and, if you’re extra nervous about parking, Audi even offers a self-parking system that can identify suitable spaces to automatically manoeuvre the car into. Audi’s standard-fit Multi Media Interface (MMI) allows you to control most of the car’s major functions through a chunky rotary dial and a small collection of buttons located between the front seats. It’s a simple system to use, and some of the shortcut keys are raised to help find the one you want by touch. The standard 7.0in display rises out of the top of the dashboard when you switch the system on and, because it’s so high, it’s easy to read without moving your eyes too far from the road. There's a variety of upgrades to choose from, including a Technology Package that brings more functionality including sat-nav, although a more basic navigation system is standard on all trims. Other key items that are standard across the range include DAB radio and Bluetooth telephone connectivity. They work well, too, with easy-to-use menus, decent radio reception and good basic integration with both Android and Apple smartphones. The standard stereo is easily good enough for most tastes, but an optional 13-speaker Bang & Olufsen sound system is available for more discerning music lovers. The standard kit compares favourably with rivals’. BMW’s system is excellent on many levels but, given its ease of use and the quality of its integration, Audi’s infotainment system is just as impressive. The A3 Cabriolet’s interior is built from the kind of materials you’d expect to find in an executive saloon. The switches feel pleasant to use, and the super-slim infotainment screen adds to an impression that no expense has been spared. You’ll struggle to find unappealing plastics anywhere, including low down. The fit and finish is superb throughout, with barely noticeable gaps between panels.